This handwoven, globally minded gift basket celebrates calming evenings and cooler temperatures. Stuffed with everything you need to relax, this palm leaf gift basket handwoven in Mexico celebrates calming evenings and cooler temperatures. 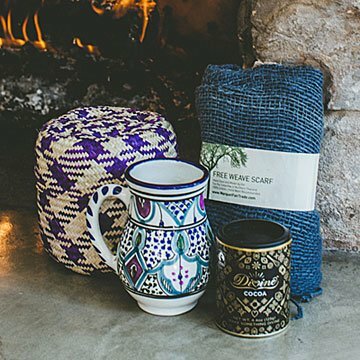 Take a global approach to your regular chill-out routine and curl up with a handwoven fair trade scarf from Thailand, or fix yourself a cup of hot Ghanaian cocoa in a mug hand-thrown and painted in Tunisia. The cocoa's even made by a fellow B Corp, Divine Chocolate, so you can feel extra good about your purchase, whether you're keeping it all to yourself or passing it on to a lucky friend. Handmade by artisans in Mexico, Thailand, Ghana, and Tunisia. Basket: 6" H x 6" Dia. The basket she keeps her knitting in, She loved the mug and cocoa and the scarf she puts on when she takes her walk in Castle Rock, Co.
Great gift for a girl who likes interesting, diverse gifts. My son's girlfriend loves hot beverages and scarfs...amazing I found both packaged together. What she liked the most was that the history and story of each item and how it was made was included with the package. Shop Fair Trade and You Benefit, Too! I originally purchased one basket as a gift, but really liked the items in the Cozy Gift Basket, kept it and ordered one more Cozy and a Savory. All I thought it would be! This is a super cute set that I've been seeing all over the internet. I finally nailed it down and ordered it for my mother in law for our family gift exchange. Each item is unique and a socially conscious purchase. Arrived on time and was a nice gift. Quality was ok, but would have liked slightly better for price. Scarf was grey vs blue as shown. Other items like photo. This is a unique gift and perfect for giving multiple people since they are all slightly different. Don't hesitate, buy it. Great gift idea. Great gifts all of the, plus you are supporting small businesses in other countries. My mother loves anything hand made but often worries about how local artisans are treated by larger corporations. This gift was perfect, since it was produced by actual people under fair trade practices. I thought it would be nice for someone I didn't know what to give. Pour favorite hot beverage, and enjoy!